The Pork Pie Appreciation Society meets every Saturday under a plaque in the 14th-century Old Bridge Inn in the Pennine vil­lage of Rippondon, Yorkshire. It has become the spiritual home of the pork pie. And in the last 12 years more than 1,000 pies have been subjected to intense critical scrutiny. Some pies sent the experts into raptures, others sent them into the gents. Pork pie connoisseurship uses all the senses. First the pie is held up to the light, to admire its colour and structure. A good pie must not mind being probed, prodded and poked and, when sniffed, it must have an aromatic bouquet The pie is cut then into two and the experts speculate upon its prove­nance and appellation. First the crust is nibbled and savoured. Then the wedge is bitten into, its jelly swilled from one side of the mouth to the other. The meat is masticated noisily to extract every subtle nuance of taste. Only in Yorkshire, it seems, can a pork pie be properly appreciated. A baked box of pulverized pig body parts is not something to be scoffed at. “A pie should be served at room temperature,” says Kevin who is the president. “And the journey from butcher’s shop to stomach should be completed on the same day. As quickly as possible.” There are strict criteria about what makes an authentic pork pie. Chief priority is the quality of pastry which should be thin and crispy-crunchy. It must never have fingerprints in it. The pie should not sweat or bleed and the meat should be pink without gaps or “rat runs”. It should be well-ground and well-packed with exactly the right amount of jelly. Above all, it should smell porky. The society was formed in 1982 when its founding members met after working out at a local gym With no food available in the Old Bridge on a Saturday night, they brought their own. Every week a different member now brings in 16 pies from a new source in the official pie-fetcher’s box - an old tea tin. His pies are judged by the members and marks are awarded for appearance, cross-section and taste, and the final tally registered in the Society ledger. The Society has an annual pie awards ceremony in which prizes are given to the cheapest (last year 29p) and most expensive pie (72p). The current holder of the wooden spoon for the worst pies brought in last year is driver Phil Batley whose pies came from Birmingham. On Saturday the Society holds its National Championships in which butchers from around the country are invited to submit their wares to see who makes the finest pork pie in the land. 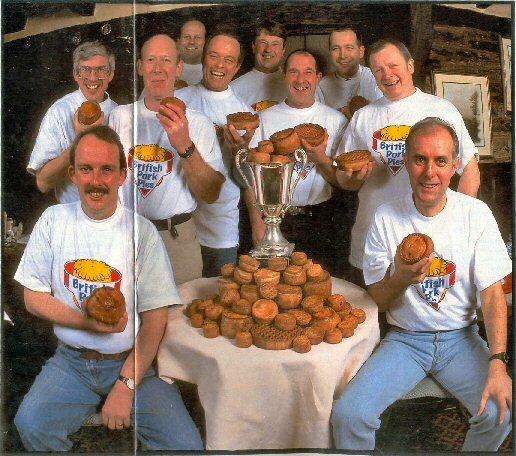 The winner of the 1995 Gold Cup was Huddersfield butcher Andrew Jones, who has had his shop for eight years and makes 3,000 pies a week Oddly, he was the first Yorkshire man to win Cornish Pasty of the Year award. His, along with Leeds butcher Heseltine’s, who finished in the top 10 in last year’s Championships, were slipped into a blind taste test of pork pies organized by the Sunday Mirror Magazine. Gloom and doom descended on the judges as soon as they saw all the samples. “I hope future generations appreciate the suffering endured in cause of the pork pie!” said head teacher Bob Letven, cutting into his first with a wince. His fellow scholars dug in. There followed a Mexican wave of pained expression. There were shudders of pain. Occasionally an eye rolled, often there was a grimace. The pies did not go down well and the air was thick with sound bites. Pints swigged, mouths wiped and deliberations complete, the marks were tabulated and the verdict awaited. There was a hush of expectancy, only broken by the odd burp. To no one’s surprise, the 1995 champion's pie was the clear winner followed by the other local crusty entrant.